The Parthenon is the centerpiece of the park. Centennial Park is a large urban park located approximately two miles (three km) west of downtown Nashville, Tennessee, across West End Avenue ( U.S. Highway 70S) from the campus of Vanderbilt University. The 21st-century headquarters campus of the Hospital Corporation of America was developed adjacent to the park. Cultivated as farmland by some of the earliest families in Nashville, the territory became controlled by the state and used as a park after the American Civil War. In the last decade, it was used as a racetrack. It was redeveloped as the site of the Tennessee Centennial and International Exposition in 1897. Afterward most of the temporary exhibit structures were removed, but the replica of the Parthenon remained. Centennial Park was opened in 1903. Due to the popularity of the Parthenon, it was rebuilt in the 1920s as a structure of such "permanent" materials as steel and concrete. it was rebuilt of permanent materials, in steel and concrete. Under Jim Crow laws, African Americans were excluded from this public park and its swimming pool until after passage of federal civil rights legislation in 1964. After the Civil War, this land was adapted for the state fairgrounds. From 1884 to 1895, more of the site was devoted to a racetrack and was known as West Side Park. In 1897, it was developed as the site of the Tennessee Centennial and International Exposition and was renamed as Centennial Park. In preparation for the exposition, the area was landscaped and new, temporary buildings were constructed for exhibit space. An artificial lake, Lake Watauga, was developed in the park, as were sunken gardens and a bandshell for music performances. The lake was named for an area in western North Carolina that was the origin of a number of early settlers of Nashville. As was common with such expositions, afterward most of the temporary buildings and exhibits were dismantled. Lake Watauga, the gardens, bandshell and the Parthenon were the most prominent features when the park was officially dedicated in May 1903. Consistent with Jim Crow laws, African Americans were prohibited from using Centennial Park, as they had been excluded from its previous manifestations as parks. 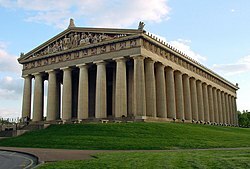 The Parthenon replica had been built as a temporary building to house the Nashville pavilion. As it deteriorated, it was proposed for demolition but residents favored keeping it. Finally, in the 1920s the city and park officials agreed to replace the temporary plaster building with a permanent, concrete and steel structure. It is still standing and has been renovated as needed. In the 1960s, the park was the site of Sunday afternoon concerts; Pat Boone was among the early performers in this series. In 1975, Robert Altman shot the climactic scene of his film Nashville in the park. ^ a b Bucy, Carole Stanford. "Ann Robertson Johnston Cockrill". The Tennessee Encyclopedia of History and Culture. Tennessee Historical Society and the University of Tennessee Press. Retrieved August 27, 2016. ^ Stanford Bucy, Carole (December 25, 2009). "Ann Robertson Johnston Cockrill". The City Cemetery. Retrieved April 22, 2017. ^ a b Zollicoffer Bond, Octavia (November 28, 1909). "The Cockrill Family". The Tennessean. p. 34. Retrieved April 15, 2018 – via Newspapers.com. (Registration required (help)). In anticipation of the ruin to Southern interests that his keen vision foresaw, he sold his large Mississippi plantation, to which he was in the habit of going every winter [...]. He also sold the 300 slaves on the plantation with the exception of about sixty selected "hands", whom he brought to Tennessee to watch and care for his sheep. ^ a b Davis, Louise (August 14, 1983). "Early Silversmiths Left Marks on City. Names of Elliston, Calhoun Figure Big in Nashville History". The Tennessean. pp. 93–94. Retrieved April 14, 2018 – via Newspapers.com. (Registration required (help)). ^ Epstein Ojalvo, Holly (February 13, 2017). "Beyond Yale: These other university buildings have ties to slavery and white supremacy". USA Today. Retrieved April 7, 2018. ^ Whitsitt Edwards, Amelia (1999). Nashville Interiors, 1866 to 1922. Charleston, South Carolina: Arcadia Publishing. pp. 27–32. ISBN 9780738502205. OCLC 44274945. ^ "Counting Up The Cost. Executive Committee Considers Plans For Buildings. Several Architects Explain Their Pictures and Discuss Possible Changes, Cost of the Buildings and Other Matters of Interest -- Hearing to be Resumed To-Day". The Nashville American. Nashville, Tennessee. November 19, 1895. p. 5. Retrieved November 23, 2015 – via Newspapers.com. ^ a b Coleman, Christopher K. (Fall 1990). "From Monument to Museum: The Role of the Parthenon in the Culture of the New South". Tennessee Historical Quarterly. 49 (3): 140. JSTOR 42626877. (Registration required (help)). In May of 1903, Centennial Park was officially opened to the public. ^ "Confederate Private Monument, (sculpture)". The Smithsonian Institution. Retrieved September 6, 2017. ^ "Negroes Seek Admittance To Swimming Pools". The Kingsport Times. Kingsport, Tennessee. July 19, 1961. p. 6. Retrieved April 22, 2017 – via Newspapers.com. (Registration required (help)). Jack Spore, city recreation director, said attendants at Centennial Park Pool refused to sell the Negroes tickets and the group left quietly. ^ "Public Pressure Expected To Open Swimming Pools". The Kingsport Times. Kingsport, Tennessee. July 21, 1961. p. 10. Retrieved April 22, 2017 – via Newspapers.com. (Registration required (help)). On Tuesday, six negroes were denied admission to a Centennial Park pool reserved for white persons. ^ Houston, Benjamin (2012). The Nashville Way: Racial Etiquette and the Struggle for Social Justice in a Southern City. Athens, Georgia: University of Georgia Press. p. 127. ISBN 9780820343266. OCLC 940632744. ^ Evans, Jim (July 16, 1964). "'Music City' Tour Set Up". The Kingsport Times. Kingsport, Tennessee. p. 11. Retrieved April 22, 2017 – via Newspapers.com. (Registration required (help)). The folks are shown where Pat Boone attended school and told how Pat got his start with the Sunday concerts in Centennial Park. ^ Bliss, Jessica (August 24, 2016). "Alan LeQuire's Women Suffrage Monument unveiled in Nashville's Centennial Park". The Tennessean. Retrieved April 22, 2017. LeQuire has created numerous public commissions in his 35-year career. At age 26, he began Athena Parthenos, the looming sculpture inside the Parthenon at Centennial Park. It took eight years to complete and was unveiled in 1990. ^ Ian Demsky. " Tornado sirens go unheard in many areas". The Tennessean, June 9, 2004. ^ "Centennial adds wireless service". The City Paper. November 10, 2005. Retrieved April 22, 2017. ^ Ferrier, Dennis. "Underground spring to help transform Centennial Park". Retrieved 2015-05-06. The spring was excavated and the stream was subsequently daylighted. ^ "Cockrill Springs is 'new' feature of Centennial Park". www.cleanwaternashville.org. Lake Watauga is a small artificial lake in Centennial Park. Johnson, Leland R. (1986). The Parks of Nashville: A History of the Board of Parks and Recreation. Nashville: Metropolitan Nashville Board of Parks and Recreation. Tennessee Centennial Exposition, Tennessee Virtual Archive, Tennessee State Library and Archives. Tennessee Centennial and International Exposition (1879) Collection, 1895-1900, Tennessee State Library and Archives.